Another day, and another opportunity to drown out your problems -- however big or small -- with free cheeseburgers presents itself. This time, the damn-good free food deal comes courtesy of Wendy's, and best of all, it good from now through the end of September. To mark the end of summer, Wendy's is giving you yet another reason to treat yourself to a greasy stack of meat, cheese, and bread: free Dave's Single cheeseburgers. The chain's wellspring of sass -- aka its official Twitter account -- announced the promotion, saying you can score the free burgers with any purchase at most of its restaurants (some might not be participating) if you download the Wendy's mobile app and choose for the freebie from the available digital offers. Any purchase means, well, anything on the menu. You could order, say, a side of fries and they'll throw in the cheeseburger for free. Boom. 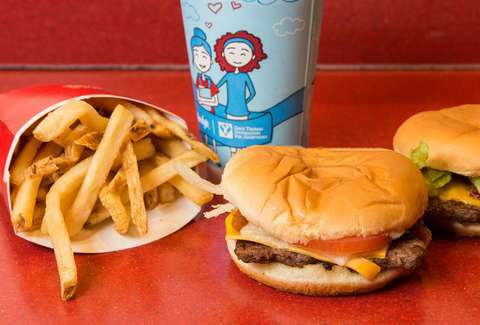 The pig-tailed purveyor of square-shaped burgers and haughty tweets has been handing out a lot of free food and discounts via its mobile app in recent months, along with a nationwide deal for 50-cent Frostys. On top of the Dave's Single freebie, there app's Offer section is currently offering coupons for buy-one-get-one (BOGO) chicken sandwiches, $1 Jr. Bacon Cheeseburgers, and $5 Dave's Double Combos. Basically, if you end up going to Wendy's on the regular, it'd behoove you to take advantage of the app's deals. All said, the Dave's Single deal is an easy way to upgrade your lunch plans or grab a quick snack. Perhaps the hardest part will be deciding what else to order with to get the free cheeseburger, but then again, you have all month to figure that out. By the way, you also have all month to get free chicken nuggets at Chick-fil-A. It's just a great month for free food, guys.